Any complex system will typically have a number of interfaces; these can be any of a wide range of types, including user interfaces, component interfaces, application programming interfaces and hardware interfaces. Enterprise Architect has built-in facilities to model all these types of interfaces and they can be connected into a single articulated model. There is support for a wide range of user interfaces including applications, web pages, and hand held devices such as Tablets and Phones, including devices such as iPhones, Android and Windows phones. Business interfaces such as people outside the organization or business processes can also be modeled. A system is typically composed of a number of subsystems which are often connected to each other through know interfaces. These interfaces are where data or control signals are exchanged between the Components. These can be modeled using the Unified Modeling Language Interface element that allows operations and services to be defined. Components can expose these Interfaces graphically in a diagram as Provided or Required interfaces allowing the Components to be connected. Hardware Nodes and Devices need to interface to other Nodes and Devices through published Interfaces. These can be described with UML Ports that can be used to describe aspects of the interface such as IP Addresses and Protocols. These describe the physical or virtual connections between the various pieces of hardware that make up the system. 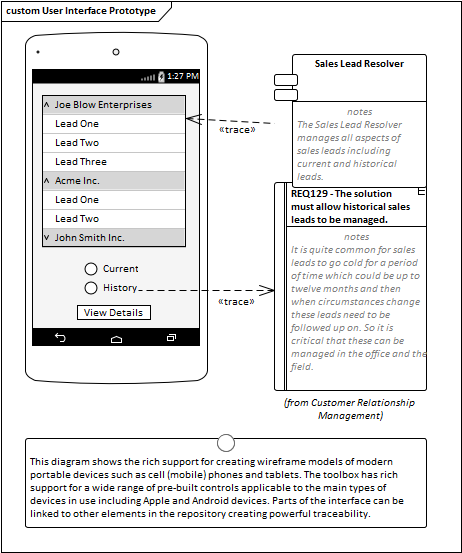 Wire Frame diagrams allow a modeler to create powerful and expressive models of the user interface for a variety of hand held devices, including Apple, Android and Windows phones and tablets. Screen dialogs and web pages can also be modeled. The physical appearance of the devices themselves can be represented and configured by the use of a number of Tagged Values. Patterns can be used to automatically create a base model for a device. A range of controls are available applicable to each type of device including Android Widgets, Apple Controls and Windows Tiles.